Hallo meine Lieben. Heute ist noch eine Karte fertig geworden. Nur bin ich leider gar nicht zufrieden mit der Coloration des Gesichtes. Die Farbe ist immer wieder verlaufen und zu allem Übel sieht das Mädel jetzt auch noch aus wie die Vampire aus Twilight. This is a great card!Lovely papers and image! How very pretty and lovely stitching around the circle, not the easiest thing to do. Many thanks for joining in at Stamping Sensations this month. Hi again, totally missed you had also linked up to Penny Black and More challenge, many thanks for sharing your lovely card. beautiful! lovely papers with that real stitching around it. This is so pretty! I love your design and color comination. 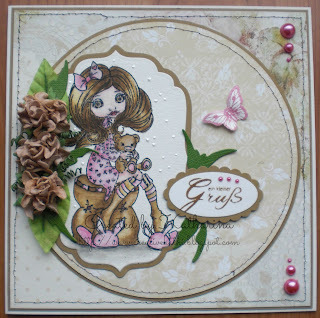 Thank you for sharing your wonderful easel card with us at Stamping Sensation. There is still some time to share another card with us. I hope to see more of your beautiful work. Such a sweet card, and an adorable image. Thanks for joining Penny Black & More @ Allsorts and Stamping Sensations challenges. Good Luck.